From working with a football team on game day to helping clients recover from injuries, earning an online master's in sports medicine opens the door to several career paths. Sports medicine online degree programs advance learners' knowledge of the human body through fascinating courses on physiology, anatomy, and biomechanics. The Bureau of Labor Statistics (BLS) projects job growth in sports medicine: a 23% increase for athletic training by 2026 and a 13% growth for exercise physiology in the same period. Both careers report an average salary of more than $46,000. What Else Can I Expect From an Online Master's in Sports Medicine Program? Online Master's in Sports Medicine Degree Program Ranking Guidelines: We selected the degree programs based on the quality of program and range of courses provided, as well as school awards, rankings, and reputation. GW's master of science in exercise science in strength and conditioning trains students in the theory and practice of resistance training, building the skills to improve athletic performance and prevent health-related issues. Students of all backgrounds can apply to the program, and GW only requires the completion of one undergraduate course in exercise physiology. This primarily online master's in sports medicine uses a synchronous online delivery format that mimics the classroom environment and enables live collaboration between students and faculty. While most coursework is online, the program does require candidates to visit campus for a three-day capstone course held at the end of the second year. The curriculum prepares graduates to sit for the certified strength and conditioning specialist designation and the level one weightlifting coaching course. Towson's master of science in kinesiology serves the needs of K-12 physical education teachers, offering degree candidates the tools to develop their professional practice. This fully online sports medicine degree uses an asynchronous format that accommodates working teachers, enabling candidates to complete work on their own schedule while maintaining a full-time teaching career. The program curriculum covers key topics, such as research design and methodology, the design and implementation of assessment tools and a physical education curriculum, and evaluation methods of teacher effectiveness. Students participate in discussions, independent assignments, and group projects, collaborating with peers through Towson's comprehensive online platform. All degree candidates complete a capstone project and a comprehensive final exam. The capstone requires students to complete a research project related to some aspect of physical education. Towson is regionally accredited by the Middle States Commission on Higher Education (MSCHE). Based in Hattiesburg, Southern Miss remains a major education center in Mississippi, serving over 14,000 students annually. The school's master of science in kinesiology with an emphasis in physical education offers support for teachers, coaches, and other instructors seeking to improve their physical education practice. Offered in a fully online format with no campus visits, the program requires a minimum of 36 credits, with both thesis and non-thesis options available. Students complete 30 core credits, studying motor learning, corrective and adaptive physical education, foundations and trends in kinesiology, program design in physical education, and legal aspects of sport. Thesis candidates complete six credits of thesis work, while non-thesis candidates complete a three-credit special problems course and one additional three-credit course. Southern Miss is regionally accredited by the Southern Association of Colleges and Schools Commission on Colleges (SACSCOC). A private Christian college based in Marion, IWU offers a master of science in athletic training that builds theoretical and clinical knowledge in athletic healthcare. This post-professional program serves applicants who have already completed an undergraduate degree in athletic training accredited by the Commission on Accreditation of Athletic Training Education. Candidates can complete the 33-credit curriculum in a year, with courses covering psychosocial issues in athletic training, health information technology, and epidemiology in athletic training. This primarily online master's degree in sports medicine requires a two-week residency session that occurs at the beginning of the program in July. This intensive residency includes two major courses: athletic training/clinical anatomy and advanced prevention and emergency management techniques. Both courses take advantage of the on-campus format to offer experiential learning opportunities. The remaining course material occurs completely online. IWU is regionally accredited by the Higher Learning Commission (HLC). One of the largest colleges in the state, Georgia Southern serves more than 27,000 students through multiple campuses and a substantial online program. While not a traditional sports medicine program, the program’s master of science in kinesiology emphasizes the scientific aspects of coaching education. This teaches professional athletic coaches about the advanced practices of administration, performance enhancement and athletic training. The program requires 36 total credits and the curriculum includes 12 courses covering topics like teaching analysis, team dynamics, sports biometrics and sports physiology. Beginning in the summer semester, this fully online kinesiology degree uses a cohort format in which students move through a set course sequence together as a group. The program includes a required practicum in which students apply course learning to their own coaching practice. Degree candidates must be employed as coaches while enrolled in the program. Located in Greeley (about an hour north of Denver), UNC serves around 12,000 students through both on-campus and distance education programs. The school's master of arts in sports and exercise science with an emphasis in sport coaching combines academic theory and applied practice to train coaches in all types of sports. Requiring a total of 30 credits, the degree covers major topics in sport pedagogy, injury prevention, sport psychology, training and conditioning principles, and applied coaching research. Students benefit from a primarily online format designed to accommodate full-time or part-time coaching schedules, as the program expects candidates to be employed as athletic coaches. The degree concludes with an action research project in which degree seekers apply program concepts to their own coaching practice and analyze the results. Most students complete their sports medicine degree online in 18 months. UNC is regionally accredited by the Higher Learning Commission (HLC). The largest and most comprehensive college in Louisiana, LSU serves more than 30,000 students through its Baton Rouge campus. The college's master of science in kinesiology with a specialization in sport management offers an interdisciplinary curriculum that emphasizes interdepartmental collaboration and communication, giving students a holistic perspective on the field of sport management. This 36-credit program includes a total of 12 courses, with six core classes that cover topics in administration, organizational behavior, social issues, finance, and sport law. Students select an additional four elective courses that explore specialized topics in the field, such as facilities management or governance and policy development. Degree candidates also can opt to perform an extended independent study into a sports management topic of their choice. Students can complete their online master's in sports medicine in 12 months of full-time study. One of North Dakota's largest colleges, NDSU enrolls more than 14,000 students annually through both a main campus in Fargo and a distance education program. The school's master of science in health, nutrition, and exercise science with an option in leadership in physical education and sport emphasizes content knowledge, teaching skills, and leadership practice, training candidates to serve as physical educators, coaches, athletic directors, and activity directors. This 30-credit online master's in sports medicine covers major topics, including sport governance, sport skills instruction and acquisition, leadership and entrepreneurship, and the role of sport in American society. All courses use a fully online, asynchronous format with no required campus visits, though students must complete observation activities in a K-12 or university athletic environment. The degree concludes with one of three final projects: a practicum, a master's paper, or a master's thesis. NDSU is regionally accredited by the Higher Learning Commission (HLC). A Christian university, CSP operates a traditional campus and an extensive online learning program, which includes a master of science in exercise science. The degree focuses on the application of exercise principles to human health, training students for work in the exercise science industry. Applicants to the program must possess a bachelor's degree in a related field and demonstrate either professional experience or research related to exercise science. Combining theoretical approaches and practical application, the online sports medicine degree curriculum includes topics in biomechanics, applied exercise prescription, nutrition and metabolism, and sport psychology. This 33-credit degree offers fully online courses in flexible seven-week blocks, making it convenient for working students to balance schoolwork and professional obligations. The program concludes with a master's capstone that synthesizes and assesses overall student learning. CSP is regionally accredited by the Higher Learning Commission (HLC). A Christian college based in Fresno, California, FPU offers two sports medicine online degree programs: a master of athletic training and a master of kinesiology -- physical education. Both programs feature fully online, asynchronous courses with no required campus visits, along with start dates in the fall, spring, and summer. The athletic training program prepares candidates to serve as trainers at the high school, university, or professional level, stressing teaching and training techniques, rehabilitation practices, and clinical teaching skills. The degree requires 30 total credits and typically takes between 18 and 22 months to complete. The physical education program helps working coaches and physical education teachers develop their professional competencies, building both technical proficiency and leadership skills. The program requires a total of 36 credits and typically takes 17-19 months to complete. FPU is regionally accredited by the Western Association of Schools and Colleges (WASC). Located about 65 miles outside of Dallas, A&M-Commerce hosts an online master of science in health, kinesiology, and sport studies with four concentration options: athletic administration, health promotion, exercise science, and physical education pedagogy. All four tracks offer fully online courses with no required campus sessions. Both the exercise science and health promotion concentrations offer thesis and non-thesis options. The athletic administration track caters to full-time coaches and teachers and takes just one year to complete. The health promotion track prepares students for careers in the wellness field, including the corporate, commercial, and community sectors. The exercise science track explores topics in physiology and conditioning, training students for rehabilitation and wellness work. Finally, the physical education pedagogy track trains certified physical education teachers in curriculum development, teaching strategies, sports psychology, and research. A&M-Commerce is regionally accredited by the Southern Association of Colleges and Schools Commission on Colleges (SACSCOC). 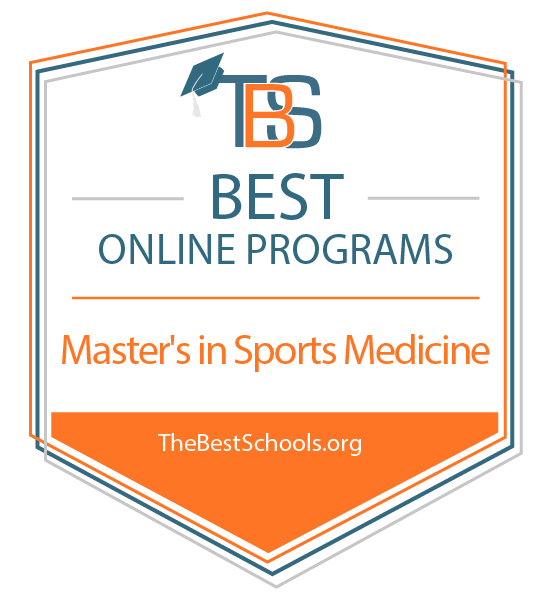 Part of the prestigious University of Texas System, UT Tyler hosts a comprehensive online program that includes one of the top sports medicine online degree programs in Texas. The 36-credit master of science in kinesiology includes an 18-credit program core, 12 credits of electives, and a thesis or internship component worth six credits. Core courses explore fundamental topics, including research design, biometric methods, motor learning, and biomechanics. Elective courses typically draw from offerings within the department of health and kinesiology, but students may take courses from other departments with faculty approval. For the program's final section, candidates complete either a thesis, performing original research into an approved topic in kinesiology, or an internship, applying program principles to hands-on work in a professional kinesiology environment. Students who do not complete a thesis must take a comprehensive exam that assesses overall program knowledge. UT Tyler is regionally accredited by the Southern Association of Colleges and Schools Commission on Colleges (SACSCOC). Based in Odessa, UTPB offers a master of science in kinesiology with three focus areas: exercise science; psychology of exercise and sport; or teaching, coaching, and administration. The 36-credit degree curriculum requires 12 credits of core courses that build fundamental knowledge in research, physiology, and exercise psychology. An additional nine credits of concentration courses enable students to explore their professional area of interest, with many course options available. For example, candidates in the exercise science track choose from courses including sports nutrition, the U.S. health system, heat stress and exercise, and applied biomechanics. All concentrations offer both thesis and non-thesis options. Thesis candidates complete 30 program credits and a six-credit research thesis that typically functions as a lab or field experiment. Non-thesis candidates complete 33 program credits and a three-credit research project, such as a field study or research survey. UTPB is regionally accredited by the Southern Association of Colleges and Schools Commission on Colleges (SACSCOC). Serving more than 23,000 students total, UTEP hosts an online master of science in kinesiology with an emphasis in the pedagogy of physical activities, training students for athletic teaching and coaching work. This online sports medicine degree requires a total of 36 credits, divided between 15 credits of core courses and 21 credits of emphasis courses. Core courses cover major topics in research, biomechanics, and exercise physiology, while concentration courses explore topics in physical education instruction and physical activity programs. UTEP participates in the UT System Online Collaborative, which allows distance learners to take online courses through other institutions in the UT System, thus making it easier to complete a degree entirely online. Applicants to the kinesiology program must possess at least 12 credits of approved undergraduate kinesiology courses. UTEP is regionally accredited by the Southern Association of Colleges and Schools Commission on Colleges (SACSCOC). Affiliated with the Southern Baptist Convention, CBU serves more than 9,000 students from a main campus in Riverside and through a diverse online program. The college's master of science in kinesiology offers an interdisciplinary curriculum that combines research methods, fitness and wellness studies, and movement science. Candidates pursuing their sports medicine degree online take advantage of a comprehensive distance education platform that includes virtual lectures, collaborative coursework, and interactive tutorials, with a flexible format that caters to working professionals. The degree requires 30 total credits and includes major topics, such as and fitness testing and exercise prescription, legal aspects of kinesiology, applied statistics, and ethics and leadership in kinesiology. The program ends with one of three culminating experiences: a comprehensive exam, a thesis, or a graduate research project. Most candidates complete the degree in about 12 months of full-time study. CBU is regionally accredited by the Western Association of Schools and Colleges Accrediting Commission for Senior Colleges and Universities (WSCUC). Based in Cedar City, SUU offers a flexible, primarily online master of science in sports conditioning and performance degree. Designed for coaches, physical educators, athletic trainers, and other fitness professionals, this online master's in sports medicine trains candidates to design effective exercise programs for diverse populations. The 33-credit degree includes 18 credits of core courses, 12 credits of electives, and a three-credit thesis. The program core covers foundational topics in sport conditioning, resistance training, sport research, and sport fitness evaluation. Electives explore an assortment of specialized topics, such as motor skills acquisition and bioenergetics. The thesis requires students to develop and defend an in-depth research project about sport conditioning. While SUU offers most courses online, the program does require candidates to attend three intensive summer clinical workshops, which last 1-2 weeks each. SUU is regionally accredited by the Northwest Commission on Colleges and Universities (NWCCU). Located in northeast Louisiana, ULM serves more than 8,000 students through both campus and distance education programs. The school's online master of science in exercise science with a concentration in sport management focuses on the business of sport and fitness, preparing graduates for work in sports marketing and faculty directing, rather than coaching or teaching. The degree requires 36 credits, with core courses that focus on sport sociology, governance and ethics, research methods, and statistical methods. Additional concentration courses explore topics in safety and risk management, leadership and administration, facility and event development, and marketing and public relations. Students also complete six credits of graduate electives, which may include internship in a professional sports management environment. ULM is regionally accredited by the Southern Association of Colleges and Schools Commission on Colleges (SACSCOC). The exercise science program is accredited by the Commission on Accreditation of Allied Health Education Programs (CAAHEP). Home to one of the best online master's in sports medicine programs in Texas, UTRGV offers fully online education as well as classroom courses from multiple campus locations in southern Texas. The 36-credit master of science in kinesiology includes 12 credits of core courses, 18-21 credits of electives, and either a thesis or independent study project. Elective offerings include both a kinesiology internship and an internship in sport, which enable students to build experience in a professional athletic setting. As part of the University of Texas Online Consortium, UTRGV offers distance learners the option to take additional courses through several affiliate institutions, dramatically increasing the number of available course options. Unique electives offered through the online consortium include history and philosophy of kinesiology, issues of women and sport, sport and society, and curricular innovations. UTRGV is regionally accredited by the Southern Association of Colleges and Schools Commission on Colleges (SACSCOC). Part of the Concordia University System, CUC operates a campus in the suburb of River Forest, just miles from downtown Chicago. Home to a sizeable distance education program, the school hosts an online master of science in applied exercise science with five concentration options: fitness and health promotion, human movement science, sports nutrition, and sports performance training, and strength and conditioning. Many candidates pursue multiple concentrations simultaneously and still complete the program within 18 months. CUC offers fully online courses with start dates every eight weeks, providing flexibility for working students. Designed in collaboration with both the International Society of Sports Nutrition and the National Academy of Sports Medicine, the program prepares graduates for professional certification exams offered through both organizations as well as through the National Strength and Conditioning Association. CUC is regionally accredited by the Higher Learning Commission (HLC). A unique institution dedicated exclusively to sports professions, the Academy operates a main campus in Daphne, Alabama, along with a distance education program that caters to working professionals. The school's 33-credit master of sport science offers five concentration options: sports coaching, sports health and fitness, sports management, sports studies, and recreation management. The varied curriculum prepares graduates for positions in teaching, coaching, management, and training, with optional emphasis areas including NCAA compliance, sports hospitality management, and sports psychology. Regardless of concentration or area of emphasis, candidates pursuing their sports medicine degree online choose from a thesis track, a non-thesis track, or a mentorship track. Both the non-thesis and mentorship tracks require comprehensive final examinations, while the thesis track does not. The Academy is regionally accredited by the Southern Association of Colleges and Schools Commission on Colleges (SACSCOC). The master of sport science program is accredited by the National Council for Accreditation of Coaching Education (NCACE). Associated with the Brethren Church, an Anabaptist Christian denomination, Ashland operates multiple campus locations around northern and central Ohio, along with a distance education program. The college's master of science in applied exercise science offers both hybrid and primarily online delivery options. Focusing on strength and conditioning practices, this online sports medicine degree prepares students for a variety of positions in the exercise field, including physical and occupational therapy, health and wellness directing, fitness instruction, and college coaching. While Ashland offers most course material online, students must visit campus for two face-to-face sessions that showcase lifting techniques and other physical activities. The program also prepares graduates for several professional certifications, including the certified strength and conditioning specialist designation and the American College of Sports Medicine's health/fitness instructor certification. Most students complete their degree in 15 months. Ashland is regionally accredited by the Higher Learning Commission (HLC). Based in Lake Charles, Louisiana, McNeese serves more than 7,000 students annually through both campus and online programs, including a master of science in health and human performance with a concentration in health promotion. Offering fully online, asynchronous courses, the program gives students the flexibility to maintain full-time employment while completing their online sports medicine degree. Graduate students select from three specialization options: exercise physiology, health promotion, or nutrition and wellness. The physiology and health promotion tracks each require 33 credits, while the nutrition concentration requires 39 credits. Regardless of specialization, program applicants must hold an undergraduate degree with either a major or minor in health and human performance or a similar field. McNeese also requires all applicants to possess three credits of exercise physiology courses and three credits of tests and measures courses. McNeese is regionally accredited by the Southern Association of Colleges and Schools Commission on Colleges (SACSCOC). Based in southern Texas, Texas A&M, Kingsville offers a fully online master of science in kinesiology with three degree completion tracks: a thesis option, a research project option, or a course-only option. Requiring 30-36 credits total, the program curriculum includes core courses and elective courses in sports administration, kinesiology pedagogy, and health/exercise science. Texas A&M-Kingsville offers online courses in a rotating format, meaning that certain courses are only available during certain semesters. For example, during the fall and spring semesters, students may only have access to one fully online elective course per term. However, the college does offer enough distance courses to make it possible for candidates to complete the degree in just four semesters of full-time study. Texas A&M-Kingsville also offers online learners the flexibility to complete the degree at their own pace by taking fewer courses each semester. Texas A&M-Kingsville is regionally accredited by the Southern Association of Colleges and Schools Commission on Colleges (SACSCOC). Located near the Arkansas-Louisiana border in the city of Magnolia, SAU serves around 4,700 students through campus and distance education programs, including a master of science in kinesiology and coaching. Designed for working coaches seeking to develop their professional skills, this 33-credit online master's in sports medicine develops competencies in accordance with the National Standards for Sport Coaches, including safety, physical conditioning, injury prevention, growth and development, and administration. The program features fully online, asynchronous courses, enabling students to complete classwork on their own schedule. Degree candidates complete 11 courses total, exploring topics such as legal issues in kinesiology, advanced exercise physiology, and psychology of athletic coaching. Applicants to the program should hold an undergraduate degree related to coaching or kinesiology, and while SAU does not require coaching experience, it may factor into admissions decisions. SAU is regionally accredited by the Higher Learning Commission (HLC). A health sciences college based in Portland, Oregon, UWS offers an online master of science in exercise and sport science with concentration options in health and wellness promotion or nutrition. The health and wellness track emphasizes general exercise science knowledge along with specialized topics in health programming. Specialization courses in this track include applied health behavioral theory, epidemiology in health and wellness, and health across the lifespan. Along with the core curriculum and specialization courses, candidates complete a research project worth 4-6 credits. The nutrition track also features an exercise science core along with topics in nutrition related to health promotion. Specialization courses include nutritional biochemistry, psychology of eating and wellness, and sport and exercise nutrition. Candidates in the nutrition track can complete additional electives, a research project, or an internship that occurs in a professional nutrition setting. UWS is regionally accredited by the Northwest Commission on Colleges and Universities (NWCCU). A private Christian college based in Houston, Texas, HBU hosts a sizeable distance education program that includes a master of science in kinesiology and sport management. The fully online, asynchronous degree emphasizes social responsibility and ethical decision-making in sports contexts. Preparing graduates for leadership and administrative positions in the field, the 35-credit online sports medicine degree focuses on the business of sport, with courses including event and facility management, financial management in sport, and legal issues in sport. In addition to the core curriculum, students complete a six-credit culminating project in the form of either a thesis or an internship. The thesis requires original research into an area of sport management, while the internship builds professional experience in an industry setting. Houston Baptist University is regionally accredited by the Southern Association of Colleges and Schools Commission on Colleges (SACSCOC). A private, nondenominational Christian college in Hobbs, New Mexico, USW serves around 1,000 students through campus courses and several online programs. The school's master of science in education with an emphasis in exercise science prepares students for an assortment of careers in the sports industry, from physical education to sport management to sports medicine. Typically completed in one year, this 33-credit online master's in sports medicine uses a fully asynchronous format that includes virtual lectures, lab experiences, and hands-on learning in the form of local internships. Candidates complete a total of 11 courses that cover key topics, such as advanced human nutrition, group dynamics, issues in sports law, and health and human behavior. The three-credit advanced practicum enables students to either intern in a professional exercise science environment or complete an in-depth research project into an approved exercise science topic. USW is regionally accredited by the Higher Learning Commission (HLC). Based in southern Texas, Texas A&M, Corpus Christi serves more than 12,000 students annually, offering a wide assortment of online and campus programs. The school's master's in kinesiology with an emphasis in sport and exercise science features both fully online and hybrid options, offering flexibility for working students. This online sports medicine degree includes a 15-credit kinesiology core, 9-12 credits of electives, and a 12-credit culminating experience, with both thesis and non-thesis options available. The program core explores major topics, including research design, leadership in kinesiology, sport physiology, and sport biomechanics. Electives offer a variety of course options, such as sport business, motor development, and a professional field experience. For the culminating component, candidates complete either a comprehensive thesis or a non-thesis capstone research project. Students in the non-thesis track also complete a comprehensive final examination. Texas A&M, Corpus Christi is regionally accredited by the Southern Association of Colleges and Schools Commission on Colleges (SACSCOC). Based in Alpine, Texas, Sul Ross offers a master of science in human performance that trains health professionals and educators in evidence-based approaches to fitness. This fully online master's in sports medicine program offers courses in accelerated eight-week blocks, enabling candidates to complete their degree in just one year of full-time study. The program also features start dates in the fall, spring, or summer semesters, offering maximum flexibility for online learners. Along with foundational courses in health and kinesiology, the degree curriculum features several opportunities for students to pursue their own areas of interest, including an individual research course and an advanced practicum/internship in exercise science. Sul Ross allows online students to perform the internship locally within their own community, making it possible to complete the kinesiology curriculum without visiting campus. Sul Ross is regionally accredited by the Southern Association of Colleges and Schools Commission on Colleges (SACSCOC). Prospective students pursuing their sports medicine degrees online must select between a variety of institutions to find one that best fits their career goals. Programs differ based on core classwork, concentration options, final projects, and course presentation, and learners must perform careful research before selecting a program. Students typically take a selection of core coursework covering topics like physiology, anatomy, sports psychology, and nutrition. Most programs also offer additional electives, which may cover other subfields. Many schools also offer concentrations within their sports medicine programs, such as chiropractic, kinesiology, and sports management. When combined with elective course options, school-specific specializations allow students to tailor their degree to their interest areas and prospective career paths. Each school has its own requirements regarding theses or final research projects. Finally, learners must consider course delivery format when selecting their online sports medicine degree. Many programs are available fully online, but some use hybrid learning, through which students attend a certain number of classes on-campus while completing most of the program online. Some programs may also require on-campus components or in-person labs for students hoping to pursue more advanced coursework or obtain a clinical position after graduation. An online master's degree in sports medicine prepare students for several challenging career paths, each emphasizing different subjects. You can expect course offerings to vary between schools, covering a wide array of information. See below five common courses you might encounter in your sports medicine program, though each school's curriculum is unique. This course on exercise physiology focuses on bodily systems and their response and adaptation to strenuous activity. This is a foundational class for students pursuing a career in exercise physiology and athletic training. Students hoping to become nutritionists gain a thorough understanding of the interactions between food and the body in this class. Learners examine diets and their relationship to performance, and how to use supplements to manage sports injuries. This class covers human anatomy and orthopedic systems through lectures and laboratory experiments. Students hoping to become athletic trainers or pursue further training in orthopedic medicine benefit immensely from this course. In this advanced sports medicine class, learners study the methods of diagnosis and rehabilitation of injuries to joints and other soft tissue. Athletic trainers use this information on a daily basis. This course analyzes the intersection of psychological and psychosocial aspects of sports, and examines the factors involved in motivation, aggression, and teamwork. This class provides ideal training for athletic trainers, sports psychologists, and personal trainers. Athletic trainers specialize in diagnosing and treating injuries. They often work with sports teams in educational or professional settings, though they may also find employment in hospitals or fitness centers. Athletic trainers need at least a bachelor's degree, and typically a certification or license. Many trainers seeking advanced positions must also obtain a master's degree. Exercise physiologists use their advanced understanding of the human body to develop tailored fitness and exercise programs for their patients. They often create programs specifically for those recovering from disease or injury. These workers must hold at least a bachelor's degree, but advanced degrees may encourage more job openings and higher salaries. Nutritionists specialize in the use of food and supplements to enhance performance, encourage healing, and help reverse chronic illnesses. Most states require nutritionists to earn a bachelor's degree and licensure; a master's degree in sports medicine also provides specialized training, allowing these professionals to understand athletes' unique physiological needs.